Pipe flashing, sometimes referred to as a roof boot, is manufactured to seal tightly around small ventilation pipes, plumbing, and other vents and equipment that protrude from the roof of a home or commercial building. The base is typically a flexible metal so that it is compatible with virtually any roofing material. The top is made from EPDM rubber or silicone so it will slip on to the pipe like a boot, which is where the name roof boot comes from. The construction is done in a matter that allows it to perform as intended through years of ice and snow, hail storms, cold and warm weather expansion and contraction, and vibration from A/C units or other nearby shakers. The formed seal provides a tight control to keep pests or gases and liquids in or out preventing leakage or obnoxious neighborhood odors. Pipe flashing comes in two different material types, EPDM pipe flashing, and Silicone pipe flashing. 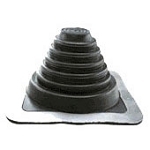 Silicone roof boots are manufactured for high temperature install locations, where as the EPDM roof boots can only be used in low temperature installations. 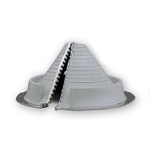 The cone has flexible steps that make adapting the pipe flashing to most roof pitches easy, while still being able to perform its designed functionality. You may also be interested in our snow crickets to protect your pipes on sloping metal roofs.